"Ireland's people, its music, its songs and stories, its struggles and passions, indeed the very place itself, physically and spiritually - all these are brought to life through the poetic and detailed writing of Howard Marshall and the imagery and photography of Ben Taylor in this life-long labour of love." "This is a book no more grand in its size, presentation and quality than the legend of the west Clare piper merits [...] Out of Darkness is an impressive investigation, reconstruction, and representation of a life in music in its own time, in the politics and history of Ireland [...] In a Romantic text set in history, with an overwhelming reverence for the way things once were, Howard Marshall ups the game in books on Irish music written by musically passionate people from outside Ireland." "What Dónal O'Sullivan did in his 1958 - Carolan: The Life, Times and Music of an Irish Harper - Howard Marshall has now done with Garrett Barry and his times in the second half of the 19th century. O'Sullivan's definitive book on the harper and composer is a priceless work of social history for Ireland in the early 18th century. Marshall does the same for Barry, and his book is a masterful treatment of Ireland in transition, culturally, socially and politically. The book could serve as a template for similar studies of key figures in the cultural life of Ireland." Ronan Browne: musician, composer and piper. 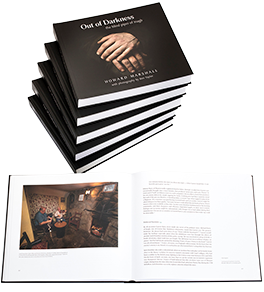 "This amazing four hundred page tome [...] will be a valuable addition to the literature of Irish traditional music in its historical context, as well as being an enjoyable and informative read." Jim Bainbridge: musician and reviewer in The Living Tradition. "The book is both a masterpiece and a labour of love which required a masterful and scholarly approach. I cannot praise the whole finished product enough." Seán Ó Laoire of Croke Park, Dublin, and Inagh.